Once the lone dissident against an army of elected officials, the land-use attorney made a name for herself pushing back against North Texas' long-planned Trinity Parkway. After 11 years, her fight paid off. DALLAS – The Trinity River is a relatively narrow, usually calm waterway that meanders past the western edge of downtown. It wasn’t a particularly popular recreation spot when Angela Hunt biked there one evening more than a decade ago. 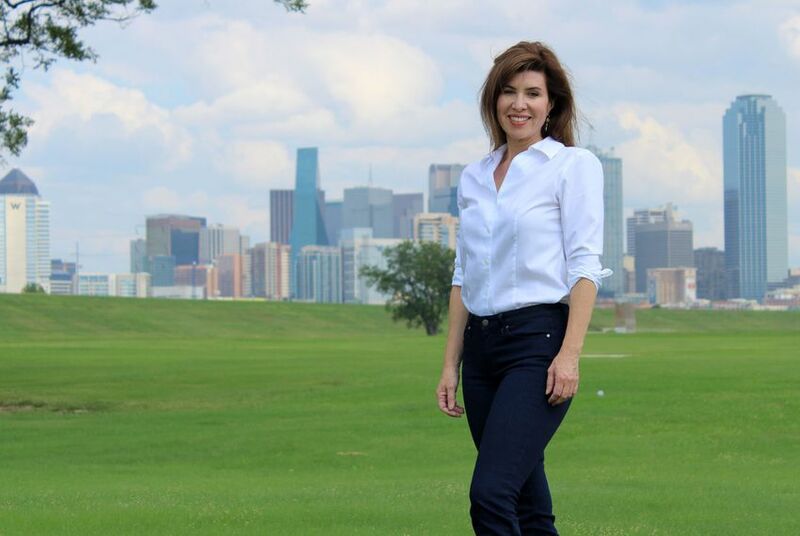 Fresh off her successful election to the Dallas City Council in 2005, the zoning and land use attorney wanted to get familiar with the floodplain where the city planned to bring an ambitious public works project to life. Unpaved paths peppered with pebbles and rocks led Hunt and her husband over the large earthen mounds that bracket the river and protect the central business district and surrounding neighborhoods from flooding. Once inside the flat, grassy basin, Hunt felt like she was in another world. The whir of city traffic was hushed below the levees, where herons stuck their beaks in the pockets of fresh water dotting the green canyon that surrounds the river. The questions she asked would launch a war. 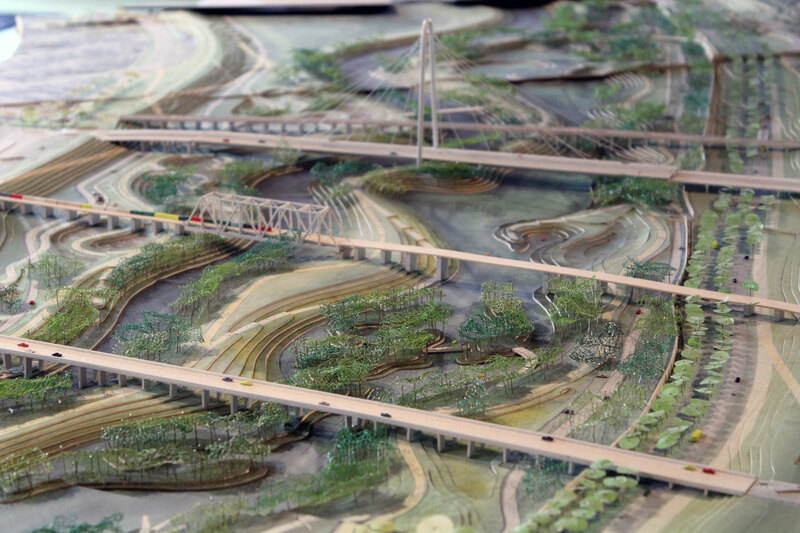 Among other things, the Trinity River Corridor Project called for extending the levees, building a massive urban park and constructing a new six-lane toll road to relieve nearby traffic congestion and provide access to the park. The estimated price tag: $1.7 billion from a mix of federal, state and local funds. What started as Hunt’s fact-finding mission became a one-woman crusade against the city’s political establishment, which then evolved into a citywide battle that has lasted more than 11 years. It all centered on one key aspect of the massive project: the planned Trinity Parkway toll road that would run alongside the park inside the levees. Supporters of the road have long said it is crucial to relieving daily congestion on the knot of highways surrounding downtown. And building a new road inside a floodplain wouldn’t require buying up private property, which would drive up the cost and almost certainly draw resistance from landowners. “It won’t disrupt established neighborhoods, it will happen faster and will have less impact on existing roads,” said longtime road supporter and former Dallas City Council member Craig Holcomb. As plans for the toll road wove through a complex and often opaque maze of governmental bureaucracies, it became a political controversy that divided Dallas and stoked distrust of many public officials. “This has always been a project no one could be honest about,” City Council member Philip Kingston said about the road at a council meeting last week. For almost a decade, Trinity Parkway supporters claimed the key victory in the debate, thanks to a 2007 referendum in which voters effectively gave the project the green light. But on Wednesday, more than four years after Hunt termed out of her council seat and exited public office, she was back in City Hall, waiting for a moment many Dallasites thought would never come. 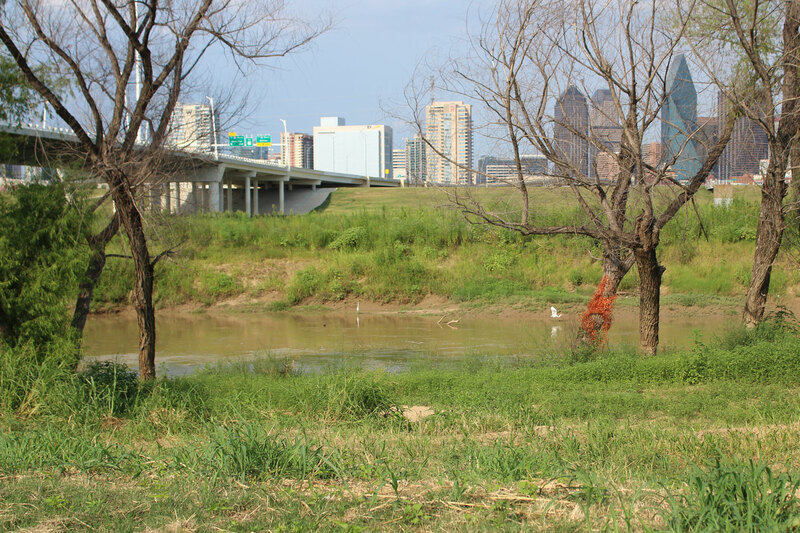 Dallas’ history is littered with a litany of ideas for the river and its floodplain. They have come from the region’s tollway authority, citizens groups, city councils and consultants that have produced a bevy of studies that feature renderings of various visions for the area. Hunt knows this better than most: She’s pored through the various iterations that are stored at the Dallas Public Library and inside the bowels of City Hall. It’s a 2003 document that lies at the heart of the current fight: the Balanced Vision Plan, which laid out the city’s master plan for the floodplain. The document put a visible vision to a $246 million bond package voters narrowly approved for the project in 1998. Its name comes from the intention of balancing five goals: improving flood protection, restoring and maintaining the area’s natural environment, creating recreational areas, spurring community and economic development and enhancing downtown-area transportation with a new road. The document envisioned Trinity Parkway as a split road. Lanes on top of the levees would serve as a reliever route for nearby Interstates 30 and 35E, which merge in what’s called the Mixmaster just south of downtown before they head east and west or north and south, respectively. Lanes terraced into the riverside of the levees would provide views of and access to the planned park. Hunt started looking into the Trinity River project by asking city staffers for budget and expenditure documents, as well as engineering drawings being prepared for the city to seek federal approval of the road. What she found surprised her. Engineers had drawn up plans for a road that was not, as expected, split into a highway reliever on top of the levees and an access road layered into the berms. Instead, it was one large-scale highway built away from the levees, closer to the river and deeper into what Hunt had thought was going to be the park. But Hunt viewed the road as a major threat to the urban park the city also wanted to build inside the levees. So she began researching her options and came up with the idea of forcing a referendum that would let voters decide whether to limit Trinity Parkway to being a four-lane, low-speed road that looked more like the parkway that was promised and less like the high-speed highway working its way through the city's bureaucracy. “That was the only other way to get rid of the toll road,” she said. Voters were told that the state was funding most of the road and if Hunt’s referendum succeeded, city taxpayers would be on the hook for a new road design. The Vote No campaign’s leadership included all of Hunt’s council colleagues, then-Mayor Tom Leppert and his two predecessors, four members of the county commissioners court, four state representatives, two state senators, two congresspeople and a U.S. senator. “It was honestly always an uphill battle because we were facing a mountain of all the other elected officials and people who had reputations in the community,” Hunt said. At debates, elected officials and transportation planners warned that if Trinity Parkway wasn’t allowed to serve as a reliever route for I-30 and I-35E, massive fixes to those highways and nearby U.S. Highway 175 wouldn’t happen. More than 79,000 Dallasites cast ballots, with 52.9 percent of them rejecting Hunt’s calls for a smaller road. But that setback didn't deter Hunt, or her supporters. Re-elected twice following her failed referendum, she continued to publicly debate the need for the toll road. Holcomb, the former council member who is now executive director of the Trinity Commons Foundation, a nonprofit set up to support the entire corridor project, was a typical public sparring partner at debates. He said Hunt was always pleasant and prepared. But also infuriating. “Because she’s so good at arguing her point of view and sometimes I did not feel I was anywhere near that good,” he said. Before Hunt termed out, the Texas Department of Transportation had started rebuilding the I-30 and I-35E interchange, a project that supposedly needed Trinity Parkway in place before it could start. By then, three other road opponents had been elected to the council. Among them was Kingston, who took Hunt’s seat. Meanwhile, the city and TxDOT had completed the Margaret Hunt Hill bridge that spans the Trinity River near downtown and whose soaring arch immediately changed the Dallas skyline. When heavy rains in 2015 caused the river to fill the floodplain and swell high upon the levees, Dallas residents flocked to a new pedestrian bridge near downtown to catch a glimpse of the rare sight. Suddenly, the combination of man-made infrastructure and mother nature gave many Dallasites a new perspective on the floodplain that had long been an afterthought as they passed over its bridges. While a majority of council members still seemingly backed the road, civic groups and former supporters were coming out against it. That included Alex Krieger, a professor at the Harvard Graduate School of Design who helped author the Balanced Vision Plan. He said the toll road that was eventually designed was not what he had originally envisioned. “If that’s killed, that’s fine,” he said this week. Still, Dallas Mayor Mike Rawlings and others have long said Trinity Parkway is necessary to solving downtown traffic woes. While it obviously wasn’t really needed for other projects to take place, as those projects had moved forward anyway, they said it was necessary to help poor minorities in southern Dallas get to their jobs on the northern half of town. “I’m still very concerned about the individuals in southeast Dallas being stuck in traffic for so long getting to their jobs,” Rawlings said this week. Federal approval for the road was largely predicated on traffic estimates that show Trinity Parkway’s construction would pull 10,000 drivers from the downtown Mixmaster on an average weekday, a 2.5 percent drop from the 397,000 cars that would be there in 2035 if the road wasn’t built. But the road would also increase traffic in several other spots, according to its own traffic projections. 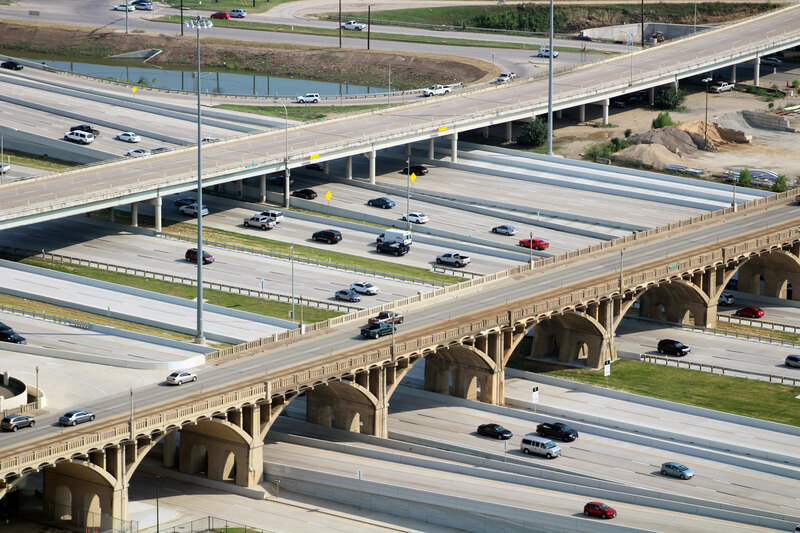 And on southeast Dallas’ U.S. Highway 175, traffic would increase by 41,000 cars a day – a 32 percent increase that federal documents predict would dramatically worsen congestion levels on that road. "It represents transportation planning from 50, 60 years ago," City Council member Scott Griggs said at a meeting last week. As opposition to Trinity Parkway mounted, Rawlings launched an effort in 2014 to scale back the road. With funding from civic leaders and philanthropists, he put together a team of transportation experts and urban planners to make the road more like the serene parkway seen in the Balanced Vision Plan. There was a catch that he and others rarely mentioned: Federal highway authorities still expected the full-scale version of the road to be built even if the city started smaller. City officials and transportation planners have never publicly provided a concrete answer as to how much of a traffic reliever a smaller toll road with fewer lanes would be. The North Texas Tollway Authority had already said the large-scale version wouldn’t raise enough money for the road’s $1.3 billion construction. Toll road critics questioned how a smaller road would help close that gap. In 2007, TxDOT officials were supposedly going to offer about $1 billion, according to supporters of the project at the time. But in more recent years, the agency has made clear that it was unlikely to help subsidize the project. While new versions of the controversial road worked through several governmental bureaucracies, public debate continued to rage. The Greater Dallas Planning Council last fall had Hunt and Holcomb reprise their familiar roles at a breakfast that focused on the project. “I felt like my arguments were good and that the audience was friendly, but when it was over I thought, if anything, more people are now opposed to the Parkway,” Holcomb said. When the Dallas City Council discussed pulling its support for the toll road last week, council member Rick Callahan passionately echoed long-running arguments for why the road should be built. Callahan, who is white, said killing the project would be a form of socioeconomic discrimination – and possibly racial discrimination. New council member Kevin Felder, who is black, shot down the notion that creating a new road is the only way to help low-income, mostly minority workers in southeastern Dallas have better access to their workplaces. He said the city should focus on creating more jobs in the southern half of the city so residents don’t have to drive as far. “We need to change our thinking, our mindset,” he said. Victor Vandergriff, one of five members of the Texas Transportation Commission, which oversees TxDOT, told council members that if they dropped plans for Trinity Parkway, the agency would move “post-haste” to figure out another way to relieve congestion on the portion of I-35E near downtown that wasn’t recently rebuilt. After that, Rawlings said he’d vote to reject the federally approved version of the road. On Wednesday, it became official: the Trinity Parkway was dead before any version of it could be built and years after Hunt and her ever-growing band of toll road opponents threw it a tongue-in-cheek funeral in hopes of rallying public and political support around a moment exactly like this. The watershed vote was 13-2 in favor of killing the road – a far cry from the 14-1 deck originally stacked against the woman. Applause broke out immediately after the vote. The council was slated to immediately begin discussing plans for the large urban park and how to structure an organization that could spearhead that ambitious endeavor. But council member Sandy Greyson asked for a moment. Greyson called Wednesday a "red-letter day" for Dallas and credited Hunt's long battle against the city's power structure for making it happen. "If this is anybody's day, it is Angela Hunt's day," Greyson said. "Congratulations." Some in the audience gave Hunt a standing ovation. Hunt quickly stood, then sat back down to watch the council's discussion on the park. After all, it was never really about the road for her. It’s always been about getting Trinity Parkway out of the way of the potential she saw all those years ago on that bike ride with her husband.